Lock & Mane via Amazon.com has Merkur Long Handled Safety Razor on sale for $26.29. Shipping is free with Prime or if you spend $35 or more. 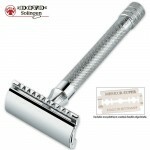 The Merkur Long Handled Safety Razor has a chrome finish. Its double edge design provides a very close shave. Its comfortable extra long handle is designed for a non-slip grip and works well with all hands especially larger hands.